This document will serve as a descriptive and visual guide to all of the branded module options available through NUsites. If you have any additional questions, and to see these modules in action, please visit http://sites.northwestern.edu/divi-modules. The Alternate Photo Float module is the most frequently used module. It’s aflexible component that allows for alternating images or video with link lists, paragraphs, or quotations. The Photo Feature is used to highlight two or threeinternal or external links using imagery. There may be multiple rows. Optionally, you can include a more detailed description that appears on hover (desktop) or click (mobile). The Feature Boxes are used to present sections in a visual manner, for example to highlight the most popular FAQ pages under different categories. Images and buttons optional. The Responsive Tabs module allows grouping of similar content to be displayed in tabbed panels. It’s typically used for presenting dense information in a compact space. The Photo Grid Module is perfect for displaying people profiles or news articles. It gives you the opportunity to display four images in every row, along with text and a link.If you use fewer than four photo items, the remaining items will be left-justified. The Statistics Callout is a great way to display numbers in an engaging way. This module is commonly used to display statistics about research. The Events module is avisual feed of your upcoming PlanItPurple events.You have to input your XML feed number, not your PlanItPurple calendar number. 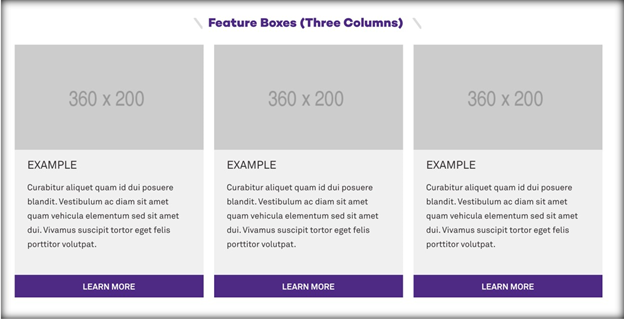 Typically, each module of a full-width index page will have a section top with the section title and some brief descriptive text. The text width options for this region are contain-970(large), andcontain-1120(full).